Both of my boys love(d) this song. They actually still ask for it at bedtime sometimes. So when I saw Heather Ross' new line, Nursery Versery, I knew that this was a print destined to make it into my stash. 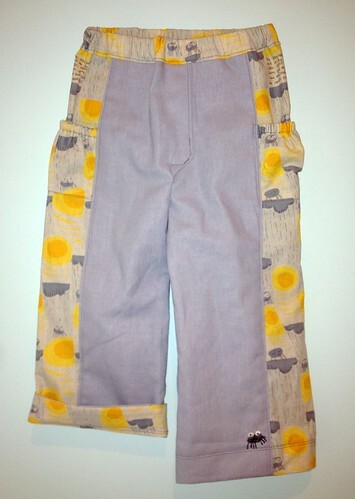 I spied some essex linen in a gray color and knew I had to make pants. When Rachel announced her Nursery Versery Contest, I knew I had to make them right. now. I actually broke my own #1 garment sewing rule and did not pre-wash the fabric. I felt okay about this because 1) the pattern is plenty roomy for my kids and 2) both fabrics were a very similar weight linen. Thank goodness it worked out in the end. So last night I spent a few minutes deciding which pattern to use and ultimately chose the Treasure Pocket Pants in the Sewing for Boys book. Since I only had 1/2 a yard of the spiders, I went with the size 2/3 (oh, how I love it when my pattern is already traced onto freezer paper and cut out - makes it go so much faster!). These are becoming my go to boy pants pattern. I just love all the details and how you can use a novelty fabric without them looking like pajamas. Which seems to happen any other time I use cutesy prints on clothes. Plus sewing with single fold bias tape (the casing for the elastic in the pockets) just makes me happy because I am dorky like that. My model was thrilled and had to wear them today. Luckily we had time for a quick spin in the wash and they came out just right. And nice and soft. I really like this lightweight linen the Nursery Versery line is printed on. I simply could not not add an embroidered spider. Good thing, because that's Will's favorite part. He showed it to everyone today, telling them "My mom made these pants and she even sewed a spider on! Wanta see him?!!?" He makes my heart melt a little. I am linking up to Katey's Handmade Parade today! Check out all the hand stitched awesome-ness. These are the cutest of all cutes...You did a wonderful job!!! These are the cutest version I have ever seen! 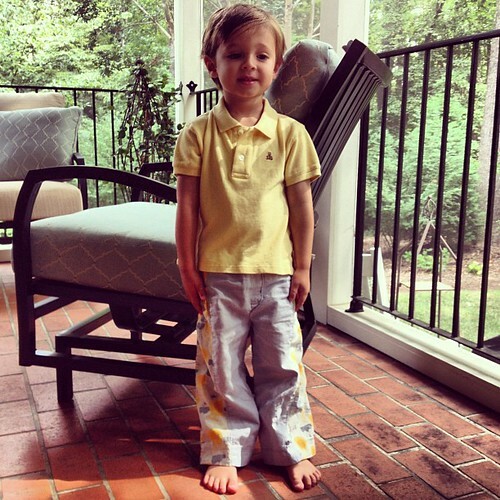 What an honor to have produced your go-to pants pattern! Those are wonderful!! 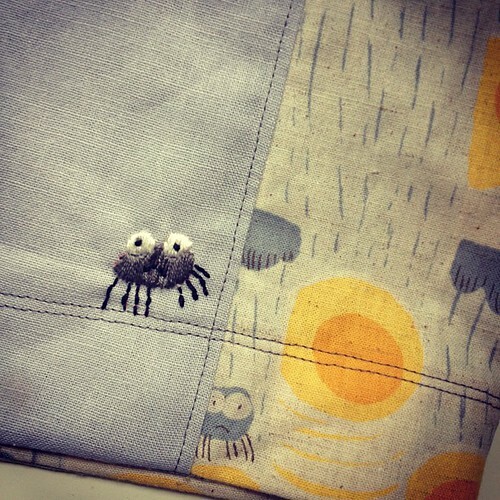 You do such a great job at sewing for your boys, and I too love the little spider you added. Hope you win. Way cute! That embroidery is the perfect finishing touch. awesome and cute! Love the embroidered spider as well. My daughter loved the "bitsy pider" as she called it back in the day, and would have loved those pants, too. Even the embroidered spider. Oh he is a sweetheart! I love that little spider you added! LOVE IT! Just love the spider. Was wondering whether you could use the fabric for a boy.. and you definitely can! very cute pants! love the fabric line outside and like your boy, my favorite is the spider! Oh, the spider!! Those are just too perfect! Makes me wish I had a little boy to sew for! Ahh! The cutest! That emroidered spider is the perfect touch! 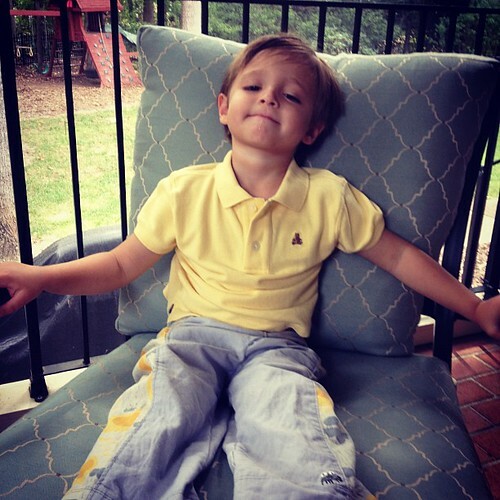 Your little boy is just adorable!! This is the cutest thing EVER!! I love that little embroidered spider...genius. These are fab and your spider is wonderful! Oh what a cute spider! Absolutely adorable!! And how cute is that little spider?!?! Yes well I too would show off my mum's spider if it looked that cute. It is really good to see some clothing for boys so I must check out that pattern you used. Good luck in the competition. Aw these are gorgeous! I'm not even going to try and enter now! These pants are the cutest! Love the designer-touch spider, too...tee hee! 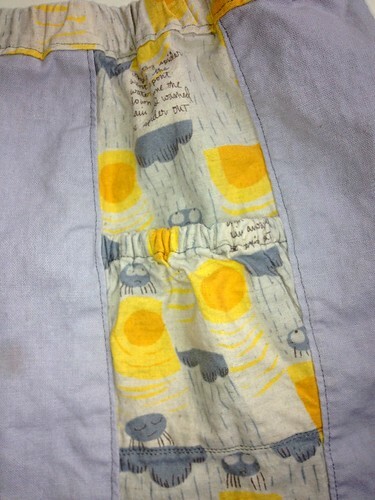 I really like Sewing for Boys; there's not enough out there for boys' things, and that one's a treasure. The embroidered spider is the perfect touch on those pants! Great job!! Choosing just 3 finalists is going to be way to hard! These pants are great. You're right - such a clever way to use a fun print without making them look like pjs. Adorable and your little one is lucky!